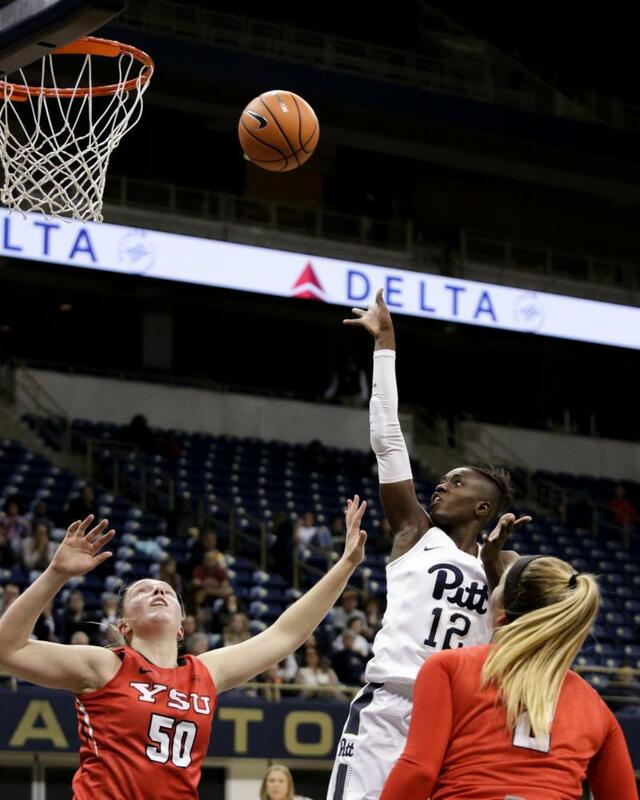 The Pitt women’s basketball team battled back from an early deficit to open its season with a 66-58 win against Youngstown Friday night. The Panthers (1-0) and the Penguins (0-1) both had relatively lackluster performances at the Petersen Events Center. Both teams made a little over a third of their field goal attempts and no more than a quarter of their 3-pointer attempts. Youngstown State dominated the game from the beginning, with senior guard Indiya Benjamin scoring the first 10 points for her team. Pitt started slow, going more than two minutes without scoring before an offensive rebound and putback by junior center Kalista Walters put the Panthers on the board. But the Penguins’ early start gave them a 10-2 lead by the first media timeout. Youngstown State went on to score seven unanswered points before Pitt redshirt junior forward Yacine Diop hit a jumper to end the run. The Panthers trailed 19-10 after the first quarter. Diop got a steal and a layup to open the second quarter. The Panthers followed suit, upping their pace and running off both defensive rebounds and Youngstown State scores. The faster pace opened up the offensive glass for Walters and Diop to force their ways to putbacks. Walters eventually put up a double-double for the Panthers, finishing the game with 17 points and 16 rebounds. Pitt’s defense tightened as well, led by junior forward Kauai Bradley and Diop who put the clampdown on the Penguins and held Benjamin to zero points in the quarter. The Panthers outscored Youngstown State 18-6 in the second quarter to enter the half leading 28-25. The second half opened with Benjamin breaking free off a screen and dropping in a mid range jumper for the Penguins. But the Panthers picked up on the ball-handler earlier this time, disrupting the Penguins’ actions on offense. The Panthers found more success in the second half with the shots they couldn’t make in the first. Junior forward Danielle Garven landed a jumper on her way to leading the Panthers in scoring with 18 points. After Bradley had to sit with four fouls, the contest seemed even as both teams traded buckets for most of the third before the Panthers came out with a tight 46-42 lead. Garven started the scoring in the fourth with a mid-range jumper, and for a moment, it became the Garven and Diop show. Garven hit a jumper, then Diop grabbed an offensive board in the teeth of the defense for a putback. A few possessions later, Diop drew a foul and hit two free throws. Garven hit another jumper to cap off an 8-0 scoring run for Pitt to put the Panthers up 61-47. Once Bradley fouled out, Diop was put in charge of holding Benjamin on lockdown. The end of the game was sloppy for both teams as the game devolved into a series of turnovers and free throws. But the Panthers held onto their lead and ended with a 66-58 win. The Panthers’ will remain at home for an 11 a.m. matchup against Cornell Nov. 13.